Amber was much prized by the residents of Jorvik, there is evidence for two workshops where amber was turned into various items of jewellery. 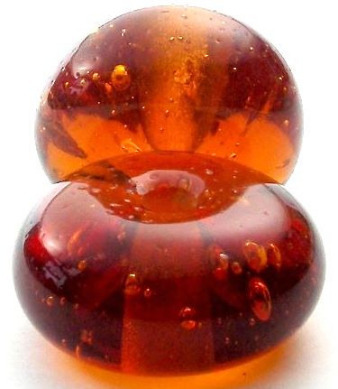 This amber-coloured glass bead is based on the large amber beads found in the site of the Clifford Street workshop. It measures approximately 36mm x 20mm, with a 5mm hole. The price is for a single glass bead.